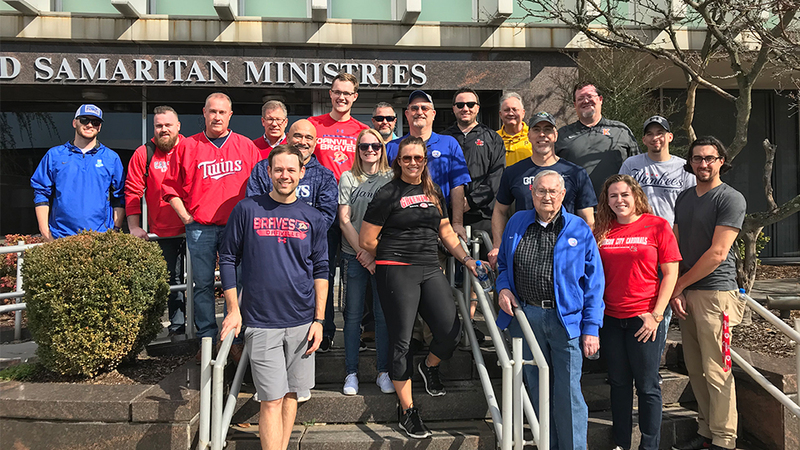 JOHNSON CITY, Tenn. - Representatives from all ten Appalachian League clubs participated in a service project with Good Samaritan Ministries Thursday morning at the League's annual Spring Meetings, held this year in Johnson City, Tenn. The League assisted the non-profit ministry with the take down procedure from their recent holiday program, the Be A Light Marketplace. "I would like to thank Johnson City Cardinals' GM Zac Clark for coordinating the service project with The Good Samaritan Ministries," said Appalachian League President Dan Moushon. "This is a great way for league members to give back to the local communities. Hopefully this will become an annual event at future Appalachian League meetings." A total of 19 volunteers participated in the service project, kicking off two days of meetings and professional development amongst the club executives in the advanced rookie league. "We are thankful for the Appalachian League and their desire to serve the community by coming together to volunteer as league management," said Pai Mushayamunda, Programs Director for Good Samaritan Ministries. "Our relationship with the Appalachian League is also strengthened by the Johnson City Cardinals who have hosted the annual Back 2 School Picnic at the TVA Credit Union Ballpark for the past several years. The Appalachian League's service signifies their heart of servant leadership and doing what matters most, which is serving others." Good Samaritan Ministries is a non-profit 501(c)(3) ministry in Johnson City that provides for the emergency needs of the poor, low income, homeless, individuals/families-at-risk, children, veterans and elderly populations through education, mentoring and social services. More information can be found at goodsamjc.org. The 2019 Appalachian League season begins on Tuesday, June 18. The complete schedule can be found at appyleague.com (click here) and ticket information is available on each individual club's website.